If you haven’t already gone nuts or seedy, then it’s time. 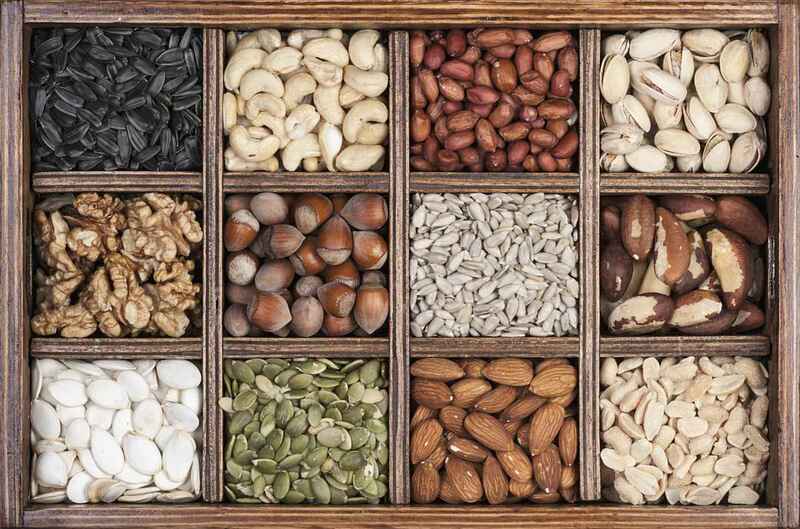 Research suggests that including nuts and seeds in the diet lowers the risk of high blood pressure, high cholesterol, abdominal obesity, cancer, heart disease and lung disease. In fact, the Food and Drug Administration (FDA) has approved food label health claims that state: Eating 1½ oz per day of most nuts as part of a diet low in saturated fat and cholesterol may reduce the risk of heart disease. Worried about the calories? Although nuts are dense in calories, studies have actually found an inverse association between nut consumption and BMI or weight gain. One study showed that individuals who ate at least ¼ oz per day of tree nuts had lower weight and waist circumference than those who did not. This may be because nuts are high in protein, fat and fiber so you stay satisfied longer and might eat less later. *Note: The household measurement quantities are approximate due to varying sizes of nuts and seeds. California produces 80% of the world’s almond supply. Peanuts are technically a legume. They pack the most protein at 7 grams per oz. A study showed that subjects eating in-shell pistachios consumed 40% fewer calories than those eating shelled pistachio kernels. Sesame seeds are especially high in sterols that lower cholesterol. Walnuts have the highest antioxidant content of the tree nuts. They also contain melatonin which is important for sleep regulation. Toss a Tbsp of chia or pumpkin seeds into your breakfast smoothie. Mix a Tbsp of almonds with a Tbsp of dark chocolate for a crunchy snack. Enjoy nuts and seeds in salads to add a healthy crunch. Mix walnuts, almonds or peanuts with dried fruit for a simple trail mix. Put ¼ cup nuts into baggies for a quick snack on the go. Toast walnuts, almond slivers or pine nuts to release their rich flavor. Dry sauté on the stovetop or toast in oven. When you start to smell the aroma, they are done. Add ground flaxseed or chia seed to cereal, yogurt or smoothies. Sprinkle ground flaxseed or chia seed on top of cooked veggies to add a nutty flavor. Go nuts and get seedy. Your health will benefit from them! Get Rid of Partially Hydrogenated Oils (Trans Fats)! Coconut Fat: Miracle or Marketing Hype?